Spray heads can get knocked out of alignment. Check all spray heads to ensure they are hitting the target. To conserve water and meet California's new water-use restrictions, one place to start is literally in one's own backyard. 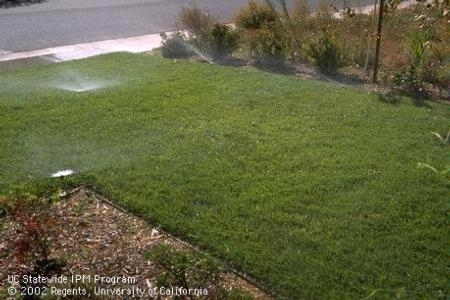 More than half of all household water use is typically used outdoors on landscape, according to University of California Agriculture and Natural Resources experts. Tune up your irrigation system right away. When water is efficiently and accurately applied, less water is needed to keep plants healthy. Spray heads can get knocked out of alignment and end up spraying the sidewalk, street or driveway and running to the gutter. Check all spray heads to ensure they are hitting the target and twist those that aren't back into place. Some heads have adjustable angles of spray, which can be fixed with a tool available at a hardware store. Look for cocked heads, which spray water up into the air, and sprays blocked by grass or those that have sunk below grade. Make sure all spray heads are made by the same manufacturer and are from the same line so they deliver water at the same rate, otherwise they'll leave dry spots. Low-volume spray heads or rotators deliver water more efficiently. To check the watering depth, use a soil probe. Water the whole root zone. On allowed watering days, irrigate until the water reaches 12 inches deep for grass, 12 to 18 inches for shrub and perennials, and 12 to 24 inches for trees. This provides a greater reservoir of water for the plants to draw from, and many will be able to get by on weekly, twice-monthly or monthly irrigation if they are conditioned to send their roots deep. 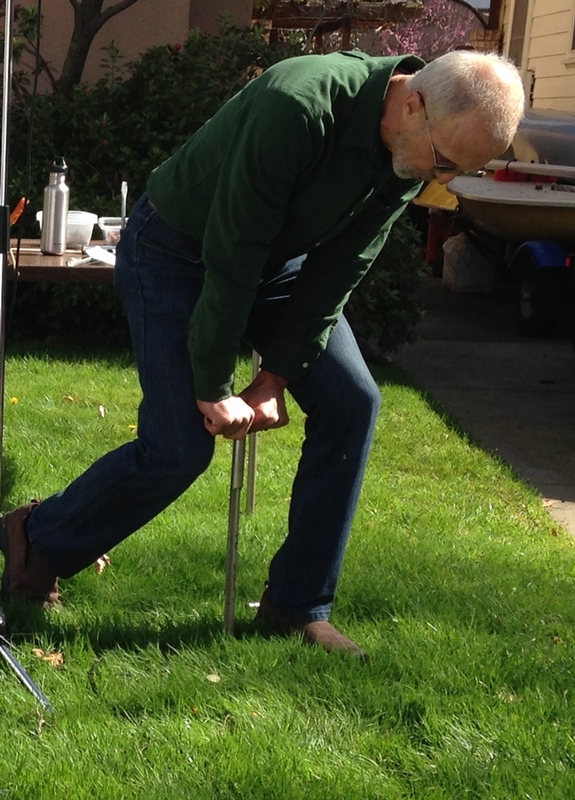 To check the watering depth, use a soil probe or push a long screwdriver into the ground. The depth it reaches easily indicates how deeply the water has infiltrated. Avoid wasting water to runoff. If water runs off before the watering cycle finishes, split the cycle time. Set the timer to water in two, three or even four cycles at least an hour apart to allow the water to soak in. To ensure water isn't flowing below the root zone, check the watering depth after each cycle. An irrigation scheduling worksheet created by Loren Oki, UC ANR Cooperative Extension specialist in the Department of Plant Sciences at UC Davis, and Darren Haver, UC ANR Cooperative Extension advisor in Orange County, helps fine tune irrigation timing. The worksheet is available for free online at the Center for Urban Horticulture website http://www.ccuh.ucdavis.edu. Switch to inline drip tubing for beds. 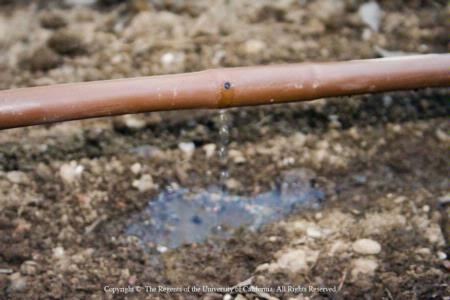 Drip irrigation applies water where it is needed with less loss to the air. Be sure to lay tubing so water reaches plants' entire root zone. MULCH, MULCH, MULCH. Adding 3 or 4 inches of organic material such as wood chips, shredded bark or bark nuggets will improve soil health while retaining water and lowering stress on your plants. Place mulch away from the street curb to prevent heavy rains from washing it into the storm drains. Inline drip tubing applies water where it is needed. 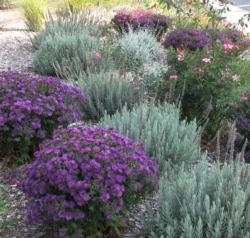 Replace water-needy plants with low water users in the fall. All plants use a lot of water to get established when they are planted in the spring and summer, and for about a year after. Trees may need extra water for several years until their roots have grown well into the surrounding soil. By waiting until temperatures cool in the fall to plant, it will be easier to abide by the water restrictions. It's also important to use hydrozoning, which means placing plants with the same water needs on the same valve. Otherwise, irrigating to the thirstiest plants on that station will give other plants more water than they need. WUCOLS IV provides an assessment of irrigation water needs for over 3,500 taxa. Photo by Ellen Zagory. To find low-water use plants that are suitable for a specific location, check UCANR's online Water Use Classification of Landscape Species at http://ucanr.edu/sites/WUCOLS. Click the Plant Search Database tab, enter the name of the city, then select the desired type of plants (shrubs, perennials, trees, etc.) and the preferred water category (low, moderate, high). The application will generate a list of plants suitable to grow in a location that fit the specified criteria.